It’s World Food Day and much of the talk around food these days is about the incredible waste. Food that doesn’t look perfect or is on the verge of beginning to spoil is being thrown away by the ton. Lots of great people are working very hard to stop this… I have a friend who picks up food from supermarkets that was destined for the landfill and delivers it to groups that help those in need. My own part is much smaller in trying to reduce waste in my own home. I used to grocery shop 3-4 times a week and a portion always languished in the crisper until I finally threw it away. I now grocery shop once a week and force myself to use what I can find in the pantry and fridge. Last night’s dinner was a great example of this because it has been 9 days since I did a grocery shop… 9 days! I volunteer for a local rescue society and this past weekend I took on another pup and didn’t want to leave her alone to go grocery shopping so I dug through my fridge to cobble together a meal. This tart came together using a few stray vegetables, 3 different bits of leftover cheese, and some meat from my freezer. It’s amazing how inventive you can get! 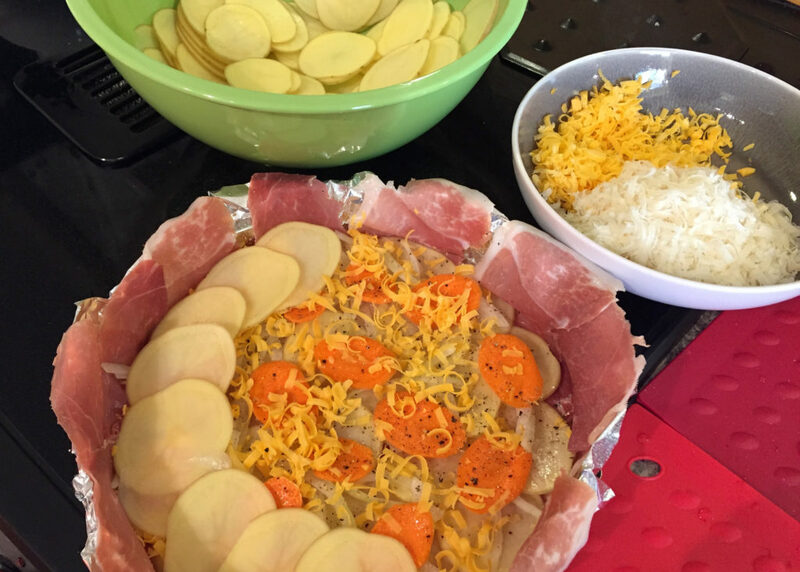 This is a Q&D recipe because I wasn’t planning to post this “throw together meal” until I had my first bite and knew I had to share it with you. In the spirit of World Food Day and reducing waste, I suggest you dig through your own fridge! 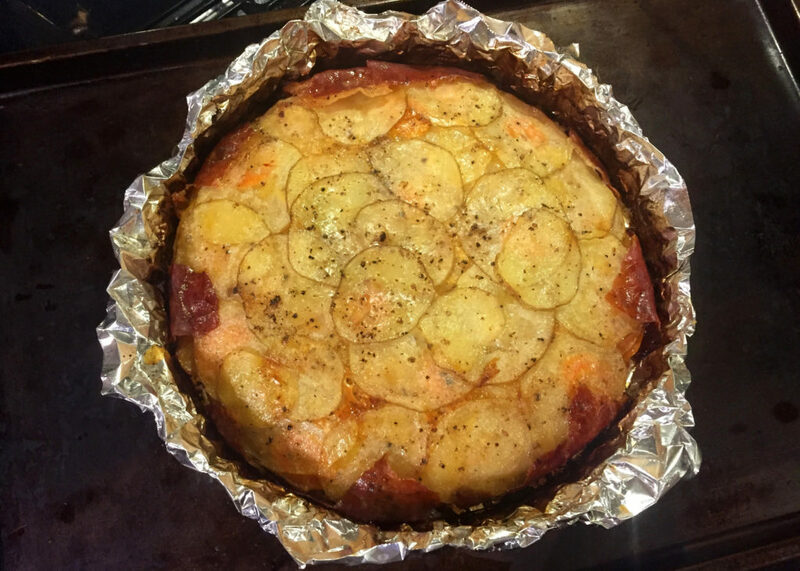 I lined my tart pan with prosciutto to make a “crust”, then used thinly sliced layers of potatoes, vegetables and grated cheese. You could use some other potato-like vegetable such as sweet potatoes, yams, or squash. Add something aromatic for flavour. I used half a leftover onion but shallots, minced garlic, leeks, or diced green onion would also work. Then dig through your cheese drawer and use up any old bits you have hanging around. I used cheddar, parmesan, and crumbled some blue on top after the tart was finished cooking. Brie would have been good. Or feta. And dot with goat or Boursin after cooking?!…mmmmm! Use up any other bits of veg in your crisper. I had a single sad carrot that I thinly sliced but I kept thinking how delicious fennel or shaved brussels sprouts would be. You could use a real crust of frozen pastry, a frozen tart shell, or dare I suggest bacon?!?! Or nothing! What’s that, you say? 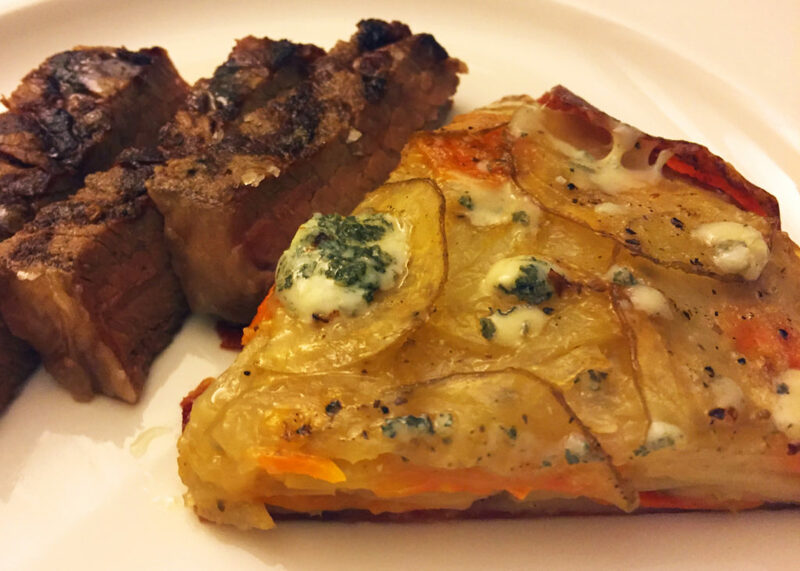 Forget about a separate crust… grease your pan well and those potatoes will bake and brown forming their own lovely crust. 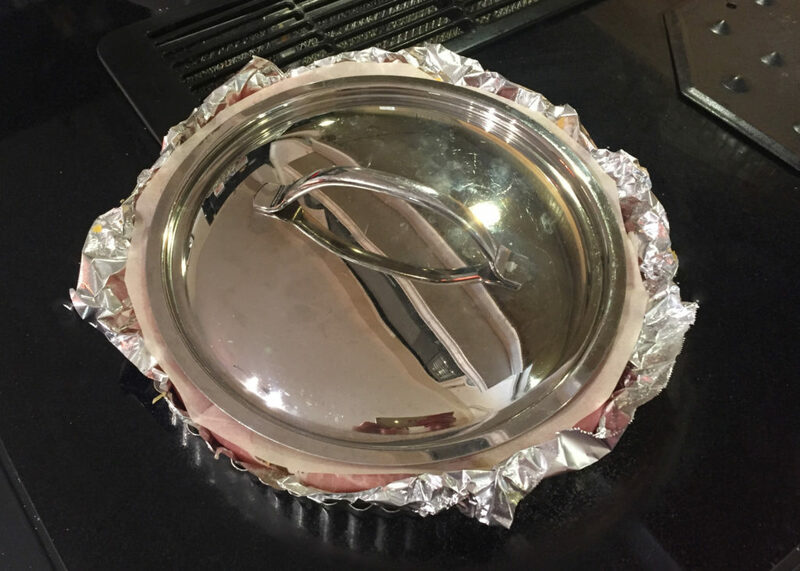 I started by lining my tart pan with tinfoil for easy cleanup. Let the tinfoil come up the sides to make the pan a bit higher. You want to build up the layers as the tart will collapse by about half as it cooks. Spray or oil the tin really well with cooking oil. If your tart pan has a removable bottom I recommend putting it on a cookie sheet while baking just in case it leaks. I covered the tart with a piece of parchment paper and then a lid to weigh it down while cooking for about 2 hours, then removed the lid and parchment for another 20 minutes to brown. It seems like a long time to bake but you really want those layers to cook together. I hope you try some version of this “refrigerator” tart. Thinly slice all your vegetables (enough to make 5 or 6 layers in your tart pan). Grate all your cheese (I had about 2 cups in total plus some blue I crumbled on top after the tart was finished cooking). If you are using something as a base or crust, start with that in a well-oiled pan. Then build your layers of potatoes and vegetables. Season each layer with salt and pepper and a drizzle of olive oil, and top with a layer of cheese. Repeat until all your ingredients are gone. Finish with a layer of potato. I suggest covering with a piece of parchment and weighing it down with a lid. Bake for approximately 2 hours, until the tip of a sharp knife easily slips through the tart. Remove the lid and parchment and let brown for another 20 minutes. I served with a few slices of steak on the side.